Ribbon Reef 3: Steve's Bommie. Steve was a fixture in the small diving scene out of Cairns in the 70s. 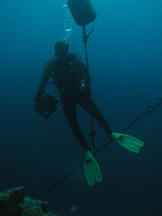 He died of shallow water blackout while free diving on this bommie. His mates named the bommie, his favorite, after him. There's a plaque there that says so. Steve had good taste. The dive just doesn't stop. For such a small place, it is jam-packed with life of all sizes, shapes and colors. Large nudibranchs, friendly turtles, several yards of anemones and 6 (count 'em) varieties of anemone fish, and so on. Very worth the 2 dives we did, and more. We weren't expecting much from the remaining 2 dives. I mean, when you reach this level of overload, you just need to stare at a blank wall for a while to recharge your wonder circuits. Century Gardens and Tak's Mooring would be showstoppers, but for following Clam Gardens and Steve's Bommie. On another itinerary, they'd inspire great gushing praise as amazing sites. And they are. Wild dolphins rode our bow(s) for a half-hour on our departure. The combination of fatigue and lack of time have conspired to make my reports sound hopelessly juvenile. I could go into greater detail, but I'm not disposed to. Please forgive me. I'm still savoring the memory of these sites. I'm just not up to dissecting their properties into words just yet. Today we dove Ribbon Reef 3. The ribbon reefs are beautifull and dense with life in all sizes. Here, a famous site known as Steves bommi served for 2 incredible dives. This site, shaped like an upside down ice cream cone was teeming with life. Both times I photographed, and Dan shot video. I celebrated my 200th hour underwater today, woo-hoo! Where does the time fly?